The hit film's villain will soon be coming to Fortnite Battle Royale. I guess the "most ambitious crossover event in history" isn't quite done yet. Marvel Entertainment's Avengers: Infinity War is still reigning over the box office, but the magic isn't over yet. Marvel and Epic Games announced today that Infinity War villain Thanos is coming to Fortnite Battle Royale in a limited time mode. The mode is "Infinity Gauntlet Limited Time Mashup" and will be available on the Battle Royale side of the game. (You can't Save the World from Thanos.) The rules are the same as normal, except the Infinity Gauntlet will be hidden somewhere on the map. Grab the weapon and you transform into Thanos, with all of the reality-bending power that comes with the Infinity Gauntlet. The news was first reported by Entertainment Weekly, who spoke with the folks behind the collaboration: Avengers: Infinity War co-directors Joe and Anthony Russo. The pair are Fortnite fans. "Over the past few months, while we were editing Infinity War, we’d take breaks to hop on and get in a few games," Joe Russo told EW. 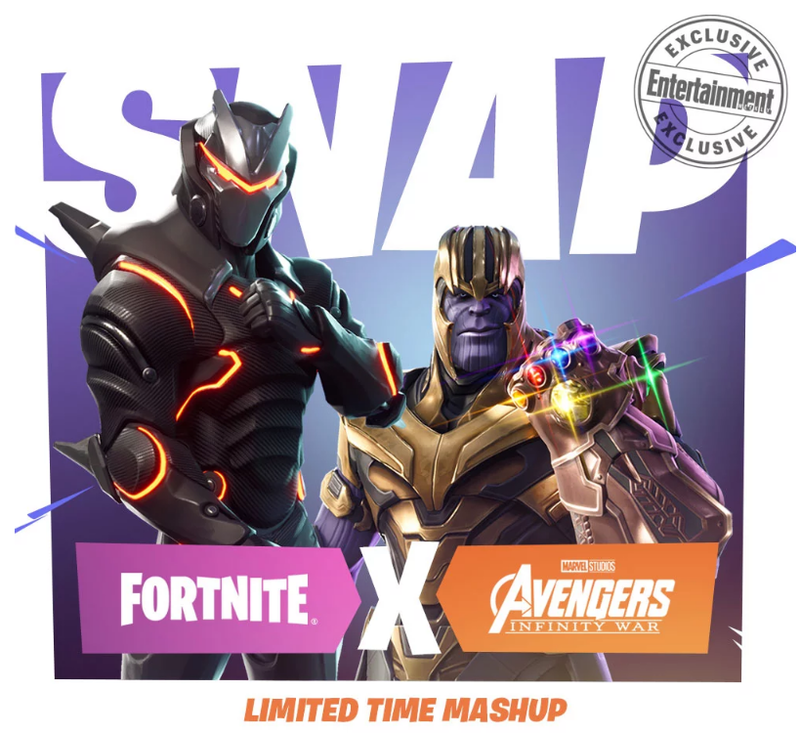 "And then we started thinking, how cool would it be to have some kind of Avengers–Fortnite mashup? So we stalked [Epic Games Creative Director Donald Mustard]." The "Infinity Gauntlet Limited Time Mashup" will be going live tomorrow May 8, following server maintenance. It's just another part of Epic Games' Fortnite Battle Royale doing its best to stay at the top of public consciousness. If it's not famous musician Drake playing Fortnite Battle Royale, Epic Games apparently has the cultural cachet to pull in a character related to the biggest film worldwide. The thing is, public visibility like this tends to lead to more. What else could be down the pipeline for Fortnite? For more on the hit battle royale game that isn't all about Fortnite skins, check out our guides on how to get started in Fortnite Battle Royale and our tips for every week's challenges.